I'm getting disconnects on suprnova when using this miner, with ewbf everything is ok - r:0. It would be really nice if there was a autostart feature built in the miner so we don't have to sit and baby sit it. Notice the additional 3 in the port number and the ssl://. Or try to use port 8815 instead of 8814. It works for me. I have a question you use that driver to mine? There is, it's called nvOC (Ubuntu based) and has a build in watchdog script. Thx for providing the logs. I've checked in which circumstances reconnecting fails on 'ssl session id reuse'. Next release will contain a fix for this case. I don't using SSL on flypool and today I got two times SSL errors with 0.5.6 on Ubuntu 16.0.4. About 1 hour disconnected. I had to go back to 0.5.5 and now I have 12 hours with no issues. Can DSTM's miner mine Bitcoin Gold? on nicehash 1 gpu = 1 worker? Yes, DSTM can mine BTG. Also a lot of disconnection problems with NH. Hi dstm, can you please confirm is this connection error and why is this happening? With previous versions I never had any problems like with this last one. It is not problem with network as I’ve two locations with rigs and it is not happening on all rigs at one location but randomly. In this case the Operating System signaled zm that the tcp connection was closed, this is why zm reconnected. Pools have multiple servers with some kind of load balancing so even if all your rigs are connected to the same pool they are likely served by different servers which may even be in different locations, this might explain the randomness. There are no changes in 0.5.6 with respect to this. Are you thinking about a unix daemon? This isn't available on windows, I don't want to diverge the versions without a good reason, I'll do ofc if there is one. If you're mainly interested in disabling the output you can redirect it to /dev/null or/and start it in your init system (e.g. using systemd). What colors and where would improve readability? What do you thing? To my mind, currently there are too many informations in the console. Thx Atexor, suggestions are welcome. The idea is to have a compact presentation of the state, such that anytime you look at the output you'll able to see the current state and the history (how things evolve) without scrolling. The most interesting values (Sol/s, Sol/W) are intentionally located to the left because of this. Just ignore the remaining numbers if they aren't important for you. In my version summary for GPU(s) will appear every X minutes or shares . In this case you would have to scroll to see the summary, it would also make it hard to see how things evolve with time, currently you simply have to pick a column an check the values top down to see how things evolve. "+++++" instead of number is strange ideaso I changed it. More info would be avaible via telemetry. Thee '++++' are there to make the representation compact, if you put every single submitted share/received job on a separate line, you will waste a lot of screen space, so you probably have to scroll to see the summary it also makes it hard to see how thing evolve. In addition the '++++' make it easy to check how the share distribution looks like, so if something goes wrong it's easy to see. + 1 for this idea. I just think you should add 3 colors for the temperatures. Below 65 - green. 65 to 79 - yellow, and 80+ - red. Also it will be good to see how many accepted shares, and how many rejected, also green for accepted and red for rejected. Per GPU and total. It would be much much better than this current mess of information. I cannot understand half of them, and really don't need them as an average miner. I though about colors for GPU temperaturs, hovewer for different models there is different level of "hot" and could be difficult do maintain and change (in config) fpr each of the cards. Also using too much colors could make it too unreadable. Rejected shares appears sometimes for me but their form Recently I had one. I think it could has red color and show as normal information. If everything works normally, there is no reason to color it at green every line. I don't know what "21" means there - number of rejected share? Also I've bringed back "*" to show where was devfee but in different place. It's the error message like it was returned by the server. For me showing year in date is unpractible (month rather too but i kept it), like that accepted shares ratio too (always equal 1.0). It's not necessary to show every line Avg. Sol/s because it doesn't change so often. On summary it would be great. Of course this is my proposals and for someone other ideas could be better. Nonetheless I hope that dstm will like my suggestions. The accepted share ratio and the Avg. Sol/s change - especially if something goes wrong. By the way - dstm. Miner started to works better to me and it haspractically a bit more better score than EWBF. Hoverwer it needs much time to spin up. I am wondering why with ewbf/dstm miner I'm able to overclock core only to 60/75mhz max, while other people on 1070/1080ti could overclock it further than 100mhz. I'm not sure what you mean by 'spin up'. ZM uses all available GPU 'power' right from the start. Okay thank you. And if I may ask - what do you think about my proposal of your miner looks? 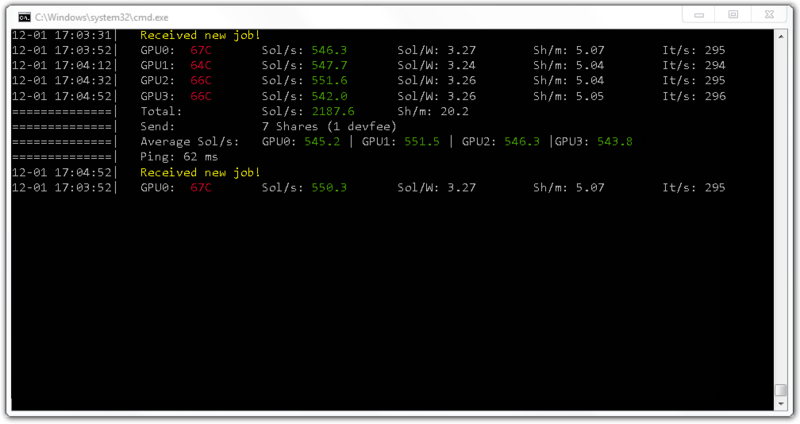 For me your miner starts from 520-530 Sols/s and then hashrate (sol/s?) increases ~550. Avg/s takes probably counts entire sols/s since start (reconnect to pool) and it works a bit strange because it takes too long term to detect average hashrate ans it increases slowly entire day. Avg from 530 to 550. There were one disconnect on suprnova so everything started from the beginning.